I meant to post on this a while ago, but I was just curious: does anybody know how (if) seminarians are trained to give homilies? I don't mean on the substance of the homily, but on public speaking: how to be persuasive, to get your point across, to speak clearly, use good hand and body gestures, etc. I've wondered about this for some time now. Any seminarians or ex-seminarians out there who know the answer to this? I am blessed to have a gifted homilist for a pastor, but I have been around to many other parishes where the preaching was severely deficient. For example, on February 14th of this year, I went to a parish where the priest began his homily this way, looking down at his notes and mumbling: "So, today is Valentine's Day, you know, with the cupids...and the arrows..." Then he trailed off into a story about a buddy of his that he used to work with at GM years ago. The story went on for fifteen minutes, had nothing to do with Valentine's Day and was only vaguely related to the Faith at all, and the congregation was looking at their watches the whole time wondering what the heck any of what he was saying had to do with anything relevant to them. Just so you know, he was not an elderly priest, but just a middle aged man. Do priests have to go through any courses on effective public speaking? They ought to. Just because the Eucharist is the center of our worship does not give you a blank check to give crappy homilies. It does not happen to often, but once in a great while I run into the cannibalism argument against the Eucharist from Protestants. 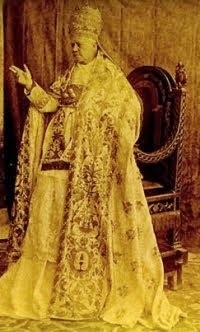 It is an interesting argument, but if the person you are talking with actually accuses Catholics of practicing cannibalism, then it demonstrates that he at least understands the seriousness with which we say that Jesus is truly present in the Blessed Sacrament, even if he does get the particulars wrong. So, what do we respond when somebody attacks the Holy Eucharist on the ground that to eat the flesh and drink the blood of Jesus would be cannibalism? For the life of all flesh is in the blood. Therefore I said to the children of Israel: you shall not eat the blood of any flesh at all, because the life of the flesh is in the blood, and whosoever eateth it, shall be cut off. If this commandment applies, then, so runs the argument, the Eucharist cannot truly be the Body and Blood of our Lord, for to consume it would be against what God commanded in Leviticus, and thus God is made to contradict Himself. What do we say to this? Well, there are two explanations, one satisfactory, one (in my opinion) more unsatisfactory. We shall look at the less satisfactory of the two defenses to this charge first. This defense comes from Dr. Scott Hahn (I do not recall where exactly I heard him give this explanation, but I believe it was on a radio call-in show). According to Dr. Hahn, the response to the Protestant charge of cannibalism is "Guilty as charged!" Hahn does not deny that we eat the Body and Blood of our Lord, and therefore asserts that the Eucharist truly is cannibalism. What else could it be if the Eucharist is truly the Body and Blood of our Lord, and cannibalism means eating human flesh and drinking human blood, which the Eucharist us: consuming the flesh and blood of a Divine Human. What about the fact that Leviticus specifically says that whoever does this shall be "cut off" from God's covenant? Dr. Hahn says that by partaking of the flesh and blood of Christ we do, in fact, want to "cut" ourselves off from the Old Covenant. In accepting the flesh and blood of the God-Man, we implicitly renounce adherence to the Old Covenant, which forbid cannibalism. Christ took upon Himself the curse of the Old Covenant, and we too must accept that "cutting off" from the Old Covenant to be truly accepted into the New. Therefore, we take upon ourselves the reprobation of the Old Covenant which was reserved to those who ate and drank blood by doing the very thing which God prohibited under the Old Law. Cannibalism is defined as eating the flesh of one's own species under the form of flesh. What do I mean "under the form of flesh?" Well, if I eat a man, say, part of his leg or arm, then I am committing cannibalism: I am eating human flesh under the form of flesh. But, let's say that a shark eats a man. The man is digested and becomes part of the shark. Then, a week later, some fishermen catch the shark, kill it and turn it into shark steaks. Then we eat the shark. Are we committing cannibalism? No. But aren't we consuming human flesh when we eat the shark which has eaten the man? Yes, but not under the form of flesh. The flesh of the man has been broken down and is not longer under that form anymore. Therefore, though in a way it can be said that we are eating human flesh when we eat the shark, we are certainly not committing cannibalism. Now, in the Eucharist, we eat the flesh and blood of Jesus Christ under the forms of bread and wine. No flesh is consumed in the form of flesh. Therefore, flesh and blood are truly consumed, but there is no cannibalism. I think this is a better (and simpler) explanation than Dr. Scott Hahn's. Hahn's explanation does not deny the charge of cannibalism and makes up a far-flung and complicated theological reason why it is okay, while the second simply reduces the matter to a confusion over the meaning of the term "cannibalism." It's been awhile since I've posted pictures of our surroundings here in Austria. 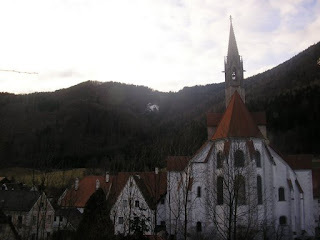 Yesterday my wife and daughter and I climbed Kalvarienberg (Calvary Mountain), which is right across the road from the Kartause Maria Thron (the one-time Carthusian monastery turned theological institute). 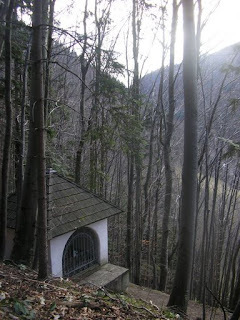 There is a via crucis up one side of the mountain (really more of a hill in comparison to the big Alps). Speaking of the Kartause Maria Thron (pictured above) and the International Theological Institute (where I am studying), Gerald Augustinus over at the Cafeteria Is Closed has a great post up about Cardinal Christoph Schoenborn's efforts to promote the ITI. Check it out here. Gerald even has some great pictures of two of the excellant Byzantine priests who serve the Eastern Rite Catholics here. "Still, very few congregations have had the courage to say something more theological: “We need to retire our old building because it does not permit us to celebrate the new liturgy in its fullness.” They will consider major surgery, but they may discover that the patient is beyond repair. Some buildings need to be retired because the sanctuary is too remote, the acoustic is too bad, communion under both forms is too difficult to administer, and the area outside the church is too small for the liturgy’s ancillary rites and processions. It has fallen to this generation to do something about it. Never before in the history of Catholic architecture has the church been faced with such a profound dilemma. .."
I find it particulalry interesting that he says the old Churches do not allow for the NO to be celebrated in its fullness. We can only imagine what he believes the "fullness" of the NO is. The reasons he gives for tearing down these old Churches are utterly trivial: bad acoustics, "remote" sanctuary (that's an ambiguous term!) and finally, "communion under both forms is too difficult to administer." Thus, the older Church is "beyond repair." 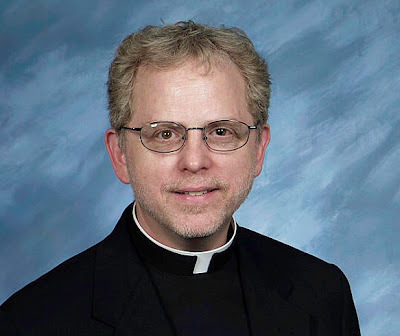 Think about what this priest is saying: he would rather tear down an old Church than give up the optional practice of Communion under both kinds. I guess even our most treasured historic Churches are to be sacrificed at the altar of the "spirit of Vatican II." Let's see what else Fr. Turner recommends; for example, what if we decide we want to preserve our old buildings instead of tearing them down? "Not to change our building may seem as though it honors the past, but it handicaps the present and hobbles the future. This old church has served us well, but history has selected our generation to make a difference in architecture that will help future generations pray. Centuries from now, people will look back on us and thank us for having the courage to change the course. Because we did, we enable our children and grandchildren to engage in all that Catholic worship has to offer.” Our generation needs to say that." "That was then. This is now. We have electricity. We don’t need windows. We don’t need resonance. We have sacrificed what nature offers and created basement churches illuminated by neon and carpeted with polyesters. Some people blamed the new mass for the loss of a sense of sacred and the poor quality of prayer in many of our churches. But we have new technologies, and we have not always employed them well. The new mass probably rescued us from becoming completely lost in a world of artificial light and sound." Rescued us from being lost in artificial sound and light? I don't know about that. According to Fr. Turner, the new Mass and the abuses that followed are not to blame for the loss in piety. No, he claims that this is due to the fact that we have not properly utilized technology. So what model does he propose we follow in integrating technology with our worship? "Many nondenominational seeker churches are finding success through an aggressive use of electrically produced sound and light. Big screens allow thousands of people to watch small actions; electronic music raises the decibels and the heart rate. Far from resisting artificial light and sound, some churches are diving into it, and they are succeeding in drawing numbers and fulfilling the spiritual needs of many people. 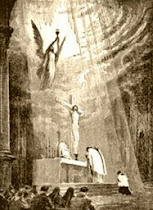 Catholic churches have resisted this movement, often with a lame and ecumenically offensive excuse such as “It’s too Protestant.” What should drive our liturgy is not what makes us different from other Christian believers whose baptism we should revere; rather, what should drive our liturgy is the kind of incarnational piety that gives the Catholic Church its juice. The people are ministers. Everyone has a part to play…But let’s face it, for centuries we have distanced people from participating at mass; we are only now inviting them to take a stronger role in singing and praying. But if we use the old models of church architecture, we can expect the old models of Catholic behavior to endure." Grr...Okay, so Joel Olsteen, Rick Warren and Benny Hinn are to be our models then. Look, just because we revere their baptism doesn't mean they get everything right. I mean, c'mon, even a Seventh Day Adventist or a Pelagian can administer a valid baptism. I don't have anything else to say on this matter. I'm just glad I live in a diocese where at least our older Churches are revered as historic treasures and not slated for destruction just because they are old. Destroying the old because it is old is the most antithetical idea to Catholicism that I can imagine. Notice from the first paragraph that Fr. Turner is the pastor of two parishes. This means that parishes have been clustered or closed in his diocese. I guess the reforms are working great in his area. Yet he thinks the problem is that the "reforms" of Vatican II have not yet gone far enough. I"m not so much angered as I am shocked that these people still don't get it. Here is an article on the Contrarians Review that lays down the argument for witholding your vote in an election when none of candidates are acceptable from a Catholic viewpoint. Mr. Triolo presents the argument much more eloquently than I can, and I highly recommend it. I recently went to a Novus Ordo Mass in one of the Detroit area's oldest and most venerable Churches. It was a large traditional building erected in the cruciform layout and was beautifully decorated in the neo-Gothic style that was popular in the 19th century. Running along walls on the upper transepts were beautiful pictures of the fifteen mysteries of the Rosary, while the dome over the apse contained seven images depicting Christ administering each of the seven sacraments (an excellent artistic reminder that sacraments are a work of God, not of man, and that it is Jesus Himself Who acts through the sacraments). The Church also had some other cool things: a devotional altar to St. Pius X, an outstanding collection of relics (incuding St. Francis, St. Clare, all of the Apostles, St. Bonaventure, St. Cecilia and many more) and a beautiful painting of the Assumption of Mary on the ceiling over the nave. At the sanctuary, the Church still had its original high altar, which was about twenty five feet high with four columns and I think at least three statues adorning it. There was also a movable altar out front as well, but it was clearly an altar and not made to look like a table. 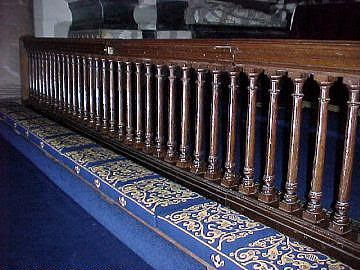 Like many older parishes, this one still had the original communion rails. When it was time to receive Holy Communion, I was shocked to see the entire congregation get up and move to the altar rails foir reception! A priest and a deacon quickly made their way up and down the line, administering under one species alone. I had never been to a Novus Ordo that used altar rails. Nothing else in this Mass was any different than your typical Paul VI Mass. It was all vernacular and celebrated versus populum (although I must say that this NO was done quite reverently and without any of the more flamboyant abuses so commonly found in NO masses). The line moved extremely quick and I knelt in the first available spot, and it was only ten seconds or so before the priest came to me, administered the Sacred Host and moved on. I was very pleasantly surprised by this experience, and I think it breaks down two common myths about altar rails. First, that they were only for the Traditional Mass and are not fitted to the new Mass. Perhaps that might be true given the way some choose to do the new Mass, but that is begging the question. "The altar rails are not fit for the new Mass because the new Mass is not fit for altar rails." Nonsense. On the contrary, this Mass reminded me that altar rails do not belong exclusively to the Traditional Mass and that they are fitting for a Novus Ordo as well, the same way that a NO can be (ought to be) celebrated ad orientam just as much as a TLM. Second, the myth that reception at altar rails takes too long. I have to say, I think that the altar rails actually made for a quicker period of reception overall while allowing more time for individual reverence. Let me explain. First, enogh people get up at once to fill the entire rail, which held probably fifty people. So a considerable amount of the congregation are up there right away. In this form of reception, the person remains stationary while the priest comes to them. Thus, you may have ten seconds or twenty seconds of prayer before the priest gets to you, and a few moments afterwards for personal devotion and thanksgiving. But meanwhile, the priest is moving right on down the line, and as soon as he gets done with one person, he can move to the next without having to wait for the person to move out of the way. Reception is as quick as the priest chooses to move. Now, when we have to come up to the priest in a line and the priest is stationary, he cannot administer to the next person until you move, and this necessitates the feeling of being rushed that many people experience in modern Catholic parishes when they go up for Communion. Also, reception at the altar rail practically means (usually) reception under only one kind. This cuts down the time that a person needs to be up there. Also, as the priest moves along, spots continually open up and the whole parish is served in a very swift way, but each individual person finds that they have a few moments for prayer and thanksgiving. Imagine going up to a priest in a line and waiting twenty seconds before you received from him, then standing there ten seconds afterward praying while he impatiently waited for you to move so he could get to the next person. It'd never happen! Altar rails allow for simultaneous swiftness of administration but reverence in reception. So, for those older parishes who are celebrating a NO and have altar rails, I'd like to remind you that altar rails are not just for the Traditional Mass and fit quite well with the NO if you are willing to implement their use. I [Mrs. Anselm] originally wrote this piece about Pope Benedict's new prayer for the conversion of the Jews in the Extraordinary Form of the Roman Rite for our personal blog which we use mostly to keep in touch with our family, but Anselm insisted that I post it here as well. Boniface had a few words to say (here) about this while it was still a rumor. "Let us pray also for the perfidious Jews: that our God and Lord would remove the veil from their hearts: that they also may acknowledge our Lord Jesus Christ. Let us pray. Let us kneel. Arise. Almighty and eternal God, who does not repel from your mercy even the Jews: hear our prayers, those which we offer for that blind people, that by acknowledging light of your truth which is Christ they will be delivered from their darkness. Through the same Lord." "Let us pray for the Jewish people, the first to hear the word of God, that they may continue to grow in the love of his name and in faithfulness to his covenant. Let us kneel. Let us stand. Almighty and eternal God, long ago you gave your promise to Abraham and his posterity. Listen to your Church as we pray that the people you first made your own may arrive at the fullness of redemption. We ask this through Christ our Lord. Amen." Note that in the Novus Ordo missal, we are not explicitly praying for the conversion of the Jews. We pray that they may be saved, without any reference to Jesus Christ being the way of their salvation, which is one explanation as to why so many Catholics (and the USCCB) today believe the Old Covenant to be salvific for the Jews. Curiously, this seems quite contrary to everything that St. Paul says in the New Testament. Since the Motu Proprio, many Jews (and specifically the Anti-Defamation League led by Abraham Foxman) have been pressuring Pope Benedict to change the Good Friday prayers, because the prayers in the 1962 missal are considered "anti-semetic". This "anti-semetism" of the Extraordinary Form has been one reason bishops cited for refusing to allow the older form, regardless of the fact that this is in direct opposition to Summorum Pontificum. When we first heard rumors that the Good Friday prayers were to be changed, we were most upset. Allowing those who are not even Catholic to dictate how we pray is absurd. I've never gotten into a tizzy that many Orthodox Jews thank God, not only once a year, but each and every day, that He did not make them a woman or a Gentile. Why should they care if I pray that they be converted? However, care they do. Over a week ago it was announced that the prayer was changed. Here is the new Good Friday prayer for the Jews in the Extraordinary Form of the Roman Rite (what a mouthful! ), translated by Fr. Z at What Does the Prayer Really Say? "Let us also pray for the Jews: that our God and Lord may illuminate their hearts, that they acknowledge that Jesus Christ is the Savior of all men. Almighty and eternal God, who want that all men be saved and come to the recognition of the truth, propitiously grant that even as the fullness of the peoples enters Your Church, all Israel may be saved. Through Christ Our Lord. Amen." Now, there are a lot of traditionalists who are unhappy about this change, and there are a lot who are either content, or even happy with it, and both sides offer good points. However, this post is getting long, and I won't go too much into that debate. He is the Pope, he has the authority to change the prayers (having the authority to do something does not always mean that what you do is prudent, but I digress), and there have been many positives since this change was announced, and here are just two: Traditionalists can no longer be considered "nostalgic," or "stuck-in-the-mud," as we now use the 2008 Roman Missal, while the Novus Ordo missal is practically medieval, dating back to 2002. And, most reassuring of all, Abe Foxman is very upset. If you really think about it for more than a second, it would be quite anti-semetic if we did not pray for the conversion of the Jews, since we pray for the conversion of everyone else, beginning with ourselves. Still, very few congregations have had the courage to say something more theological: “We need to retire our old building because it does not permit us to celebrate the new liturgy in its fullness.”  They will consider major surgery, but they may discover that the patient is beyond repair. Some buildings need to be retired because the sanctuary is too remote, the acoustic is too bad, communion under both forms is too difficult to administer, and the area outside the church is too small for the liturgy’s ancillary rites and processions. It has fallen to this generation to do something about it. Never before in the history of Catholic architecture has the church been faced with such a profound dilemma. .. Not to change our building may seem as though it honors the past, but it handicaps the present and hobbles the future. This old church has served us well, but history has selected our generation to make a difference in architecture that will help future generations pray. Centuries from now, people will look back on us and thank us for having the courage to change the course. Because we did, we enable our children and grandchildren to engage in all that Catholic worship has to offer.” Our generation needs to say that. That was then. This is now. We have electricity. We don’t need windows. We don’t need resonance. We have sacrificed what nature offers and created basement churches illuminated by neon and carpeted with polyesters. Some people blamed the new mass for the loss of a sense of sacred and the poor quality of prayer in many of our churches. But we have new technologies, and we have not always employed them well. The new mass probably rescued us from becoming completely lost in a world of artificial light and sound. Many nondenominational seeker churches are finding success through an aggressive use of electrically produced sound and light. Big screens allow thousands of people to watch small actions; electronic music raises the decibels and the heart rate. Far from resisting artificial light and sound, some churches are diving into it, and they are succeeding in drawing numbers and fulfilling the spiritual needs of many people. Catholic churches have resisted this movement, often with a lame and ecumenically offensive excuse such as “It’s too Protestant.” What should drive our liturgy is not what makes us different from other Christian believers whose baptism we should revere; rather, what should drive our liturgy is the kind of incarnational piety that gives the Catholic Church its juice. The people are ministers. Everyone has a part to play…But let’s face it, for centuries we have distanced people from participating at mass; we are only now inviting them to take a stronger role in singing and praying. But if we use the old models of church architecture, we can expect the old models of Catholic behavior to endure. I have been wanting to post on this question for quite awhile, especially since I began the Mount Sinai series back in 2007. 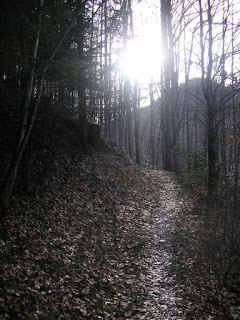 Two sites have been proposed for Mt. 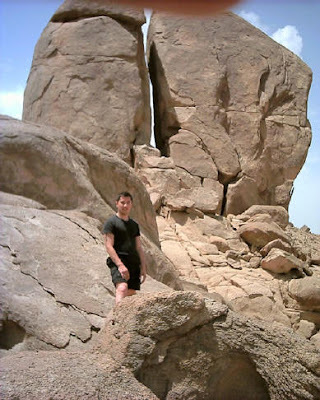 Sinai: one, the traditional site, Jebel Musa in the Sinai Peninsula between Egypt and Saudi Arabia. This site has been venerated as the biblical Mount Sinai since at least the 1st century by Jews and Christians alike and is the site of the famous St. Catherine's monastery. In two previous posts, I went over the historical and scriptural evidence that this indeed is the biblical Mount Sinai upon which Moses received the Ten Commandments. The second proposed location, and one that has garnered lots of attention in the past twenty years, is a site known as Jebel al Lawz, which is situated in modern Saudi Arabia just across the Gulf of Aqaba from the Sinai Peninsula. There are several reasons put forth for this view, of which I will enumerate here. I want to say first that for many years, I myself was convinced that this site in Arabia was indeed the biblical Sinai, but I have now come to seriously doubt it. After going into the reasons why this site is put forth, we will look at some problems with the theory. First, St. Paul says that Mt. Sinai is "in Arabia" (Gal. 4:25), thus leading some to believe he means the Arabian peninsula. 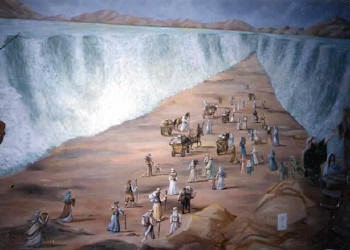 Second, the existence of a land bridge between the Sinai and Arabian peninsulas across the Gulf of Aqaba that would serve as an ideal crossing point for the Israelites. Third, several archaeological finds at the foot of Jebel al Lawz which are purported to be the remains of the Israelite camps: an altar, carvings of cows, and a split rock. 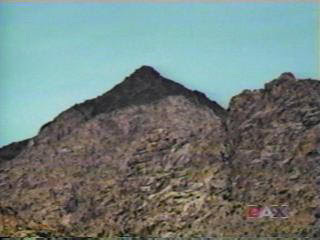 Fourth, the top of Jebel al Lawz appears to be blackened, as if by a great fire. Let's look at these points, one at a time. First, the passage of St. Paul in Galatians 4:25 in which he says that Mount Sinai is in Arabia is, on the surface, a strong argument in favor of Jebel al Lawz until we realize that Saudi Arabia did not become an indepentdent nation until 1927 (until then, it had been part of the Turkish Empire for centuries). St. Paul would not have been using 21st century geopolitical terms in his geography, but rather the political terms of the Roman Empire. As it turns out, "Arabia" was a Roman province that encompassed part of Egypt, the Sinai Peninsula and parts of what are now Jordan. Interestingly enough, Roman Arabia did not include the modern Arabian Peninsula. This was all documented in my post on the Scriptural evidence for Jebel Musa. Therefore, I think we can throw out Galatians 4:25 as lending any serious support to Jebel al Lawz. Second, what about the land bridge that exists between Sinai and Saudi Arabia? Proponents of Jebel al Lawz stress that this land bridge could have been the place where the Israelites crossed into Arabia. Aside from the obvious problem that the Scriptures state that the crossing happened at the Red Sea, not the Gulf of Aqaba (and we will have a future article about the much contested definition of the Hebrew Yam Suph), this theory suffers from other defects. First, the simple fact that an underwater land bridge happens to exist does not mean that is where the crossing happened. Case in point: a similar land bridge exists north of the Red Sea near the Gulf of Suez, very close to the traditional site. This would be a much better location to place the crossing. Second, this land bridge from Sinai to Arabia is less than a mile across, much to narrow to accomodate the great numbers to people that needed to cross in the amount of time (a single night) that Scripture says it took for them to get across. Third, the makeup of this land bridge is not land at all, but coral. Anyone who has ever been around coral knows that it is extremely dangerous to walk on. It is almost certain that many of the Israelites would have been barefoot, and even a single slip could have been deadly. This would have slowed up the crossing even more and makes a single night crossing almost impossible. I should also point out that this crossing location is very problematic from the standpoint of the amount of time the Bible says that it took the Israelites to get to the Red Sea. Instead of going just to the Suez on the borders of Goshen, this theory requires them to get to the Gulf of Aqaba on the far side of Sinai (a distance of 350 miles in six days (averaging 58 miles a day, or almost 43 miles per day allowing for six hours of rest per night). While this may be feasible for a man in the prime of his life and aqcuainted with desert travel, it becomes absurd when we apply it to a million people, including the elderly, women and children. Next, we come to the archaeological finds at Jebel al Lawz. These consist of the following items: a large altar decorated with bovine carvings, which proponents say are the Egyptian deities Hathor and Apis, or perhaps represent the Golden Calf itself. Also found was a large boulder split down the middle, which some say is the stone from which Moses drew water. A cave nearby has been called "The Cave of Moses" since very early times and supposedly was where Moses dwelt. Most of these finds are easily written off due to a few facts: first, the "altar" at Jebel al Lawz is a pile of massive boulders. 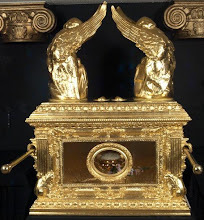 The Scripture says that the altar was built by Aaron (Ex. 32:5), indicating it was probably not as monumental in scale as that which exists at Jebel al Lawz. Also, the carvings of cows on the altar are also joined by carvings of plenty of other animals, ibexes, for example. This means that the altar is not necessarily "bovine" in nature. Both it and the carvings have been dated to the Neolithic period, well before the Exodus. Also, if Moses destroyed the Golden Calf because it was an idol, why wouldn't he destroy the carvings as well? And why would he leave the altar up, when if every other case in Scripture the altars of false gods are torn down? Also, this "altar" does not look that much different from hundreds of other rock formations which litter the plains around the site. What about the so-called "Cave of Moses?" This has been positively identified as a Nabatean tomb dating from a millenium after Moses. It must be pointed out that the so-called "split" is not a split at all, but a massive separation (several feet wide in some places) that is due to wind erosion. I have seen such formations on Mackinaw Island in upper Michigan. They are not unique at all. There are literally dozens of sites in Arabia with such blackened tops. 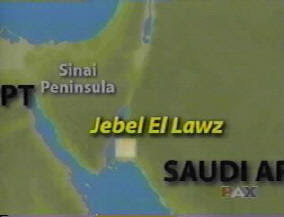 In general, it seems that the proponents of this Jebel al Lawz site have one technique in common: to take characteristics that are common to Saudi Arabia (but which most westerners are ignorant of) and put them forward as unique identifiers of this one place with the biblical Mount Sinai. First, it was originated by Muslim polemicists during the Crusades. Previously, they had not cared about the location of Mt. Sinai, but with the influx of Christians visiting the Holy Land, they wanted to identify Sinai with their own holy places in the Arabian Peninsula. Second, the modern theory was forumlated by none other than Ron Wyatt and Bob Cornuke, evangelical fundamentalists who admit that they are neither archaeologists nor geologists and who also claim to have found Noah's Ark, Sodom and Gomorrah and the Ark of the Covenant. Some people claim that the fact that the Arabian government has this site fenced off is an indicator that it is the true Mt. Sinai. Anybody who has ever been to Greece, Rome or anywhere with lots of historic sites knows that many historic places are fenced off. Many of you probably know the frustration of visiting a famous site only to find that it is closed or gated off, as happened to me when I went to Stonehenge in 1998 (there was a fence prohibiting you from getting closer than 10 feet). My friend went to Greece in 1997 and was ticked when he found that the Parthenon was fenced off that year for renovations. Archaeological sites often get fenced off. While Jebel al Lawz looks impressive on the outside (and it is a legitimate archaeological site, only it is Neolithic and not Hebraic in origin), we cannot simply abandon the set principles of archaeology and erudition just because we are desperate to identify somewhere with a biblical location. Ultimately, biblical archaeology does not affect our theology; but, often the way we do biblical archaeology tells us something about our theology. Click here for an excellent article by Gordon Franz treating this much more in depth than I have here. "When Enosh had lived ninety years, he became the father of Kenan. Enosh lived after the birth of Kenan eight hundred and fifteen years, and had other sons and daughters. Thus all the days of Enosh were nine hundred and five years; and he died" (Gen. 5:9-11). Ussher attempted to read this as meaning that Kenan was literally the son of Enosh, a plausible interpretation at first sight. However, this results is absurdities all along the way - just one example is that he trims Israel's time in Egypt to 200 years and something whereas Exodus 12:40 states that Israel dwelt in Egypt for 430 years to the day. Another approach, however, that I happened across in reading Robert Sungenis, is looking at examples like the above in the following way: when Enosh was 90 he fathered the man who was to become the anscestor of Kenan - who was born himself in the same year that Enosh died. This is certainly a possible interpretation as the word "begat" can refer to sons and descendants at further remove. Exceptions are found where the text states specifically that the father named his son, as Adam named his son Seth, and Seth named his son Enosh. These, then, are literal father-son relationships. Following this line of interpretation I came up with the following as the historical timeline of Gensis. Dates will be from the creation of the world, along the lines of the Roman ab urbe condita. Enjoy! This would put the Exodus by the way at 9506 - four hundred and thirty years after Jacob's entry into Egypt. If we accept the consensus of historians that the Exodus took place around 1,500 B.C. we can work that back into our timeline and see that Abraham lived about 2,000 B.C., the Flood was about 5,000 B.C. and the creation of the world occured about 11,000 B.C. "It was not our death that ever we feared. But we knew that we were not lords of our own lives, and therefore for want of answer would not be guilty of our deaths. The only thing that we have now to say is, that if our religion do make us traitors, we are worthy to be condemned; but otherwise are, and have been, as good subjects as ever the Queen had. In condemning us you condemn all your own ancestors - all the ancient priests, bishops and kings - all that was once the glory of England, the island of Saints, and the most devoted child of the See of Peter. For what have we taught, however you may qualify it with the odious name of treason, that they did not uniformly teach? To be condemned with these lights - not of England only, but of the world - by their degenerate descendants, is both gladness and glory to us." 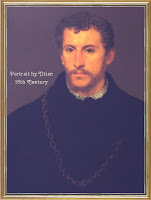 I highly recommend, by the way, Evelyn Waugh's Edmund Campion: A Life. His is the story of a priest who gave everything for the preservation of the traditional Mass. 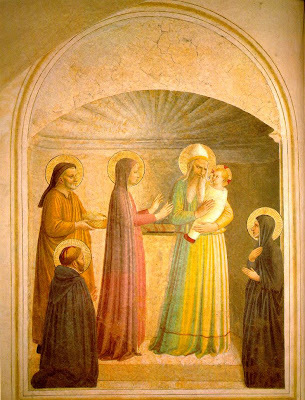 The Feast of Candlemas, which derives its origin from the local observance of Jerusalem, marks the end of the feasts included in the Christmas cycle of the Liturgy. It is perhaps the most ancient festival of our Lady. It commemorates not only the obedience of the Blessed Virgin to the Mosaic Law in going to Jerusalem forty days after the birth of her Child and making the accustomed offerings, but also the Presentation of our Lord in the Temple, and the meeting of the Infant Jesus with the old man Simeon - the Occursus Domini, as the feast was anciently termed. This is the principal theme of the liturgy on this day: Jesus is taken to the Temple "to present Him to the Lord." So the Lord comes to His Temple, and is met by the aged Simeon with joy and recognition. The procession on this day is one of the most picturesque features of the Western Liturgy. The blessing and distribution of candles, to be carried lighted in procession, precedes the Mass today - a symbolic presentation of the truth proclaimed in the Canticle of Simeon: our Lord is the "Light for the revelation of the Gentiles." The anthems sung during this procession, eastern in origin, will express the joy and gladness of this happy festival, and the honor and praise we give to our Blessed Lady and her Divine Son by its devout observance. Reading paragraphs like the above (taken from the 1962 Daily Missal) always makes me sad, and also a bit angry, at having been deprived of such beautiful parts of our common Catholic patrimony. God willing though Maria will grow up in a different era of the Church, one in which such things are allowed to flourish once more. The Christmas tree and other decorations came down in the Byzantine chapel this morning after Divine Liturgy. And Lisa produced some fine examples of traditional European Candlemas Day fare: crêpes (with Nutella inside - I don't know how traditional that is, but we discovered it in Orvieto and loved it). Boniface note: Remember that breaking with Tradition and failing to hand on what has been passed down is actually a form of theft because future generations are robbed of the beauty that their ancestors enjoyed, as Anselm says, we are "deprived." 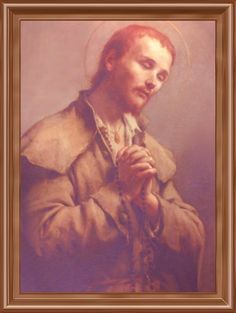 As the Western world moved out of the early modern period (1600-1789) and into the modern era, the changes brought forth in society from the Industrial Revolution caused a massive upheavel in the social, political and economic realms necessitated a response from the Church on the proper way to integrate perennial Catholic morality in this new environment. 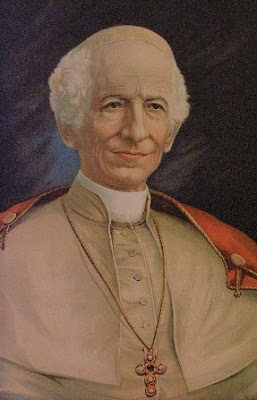 This concern brought forth the groundbreaking encyclical Rerum Novarum from Leo XIII in 1891. The encyclical addressed the proper relationship of workers to their management, the rights of workers and what a just wage consists of, condemned violence in labor movements, among many other things (very importantly, the refutation of socialism). Probably no other pronouncement on the social question has had so many readers or exercised such a wide influence. 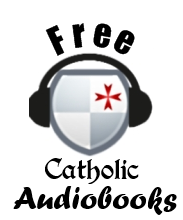 It has inspired a vast Catholic social literature, while many non-Catholics have acclaimed it as one of the most definite and reasonable productions ever written on the subject. 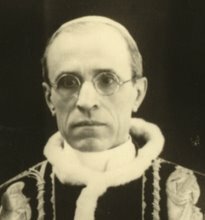 Rerum Novarum only grew in importance as the twentieth century unfolded and nations experimented with new economic systems of organization, prompting a reaffirmation of RN in the 1931 encyclical Quadrigesimo Anno of Pius XI and in the 1938 Divini Redemptoris, which categorically condemned Communism based on, among many other things, principles set forth in RN. All subsequent documents on Catholic social teaching were rooted solidly in Rerum Novarum. For example, Quadrigesimo Anno (1931) quotes RN 29 times. Divini Redemptoris quotes RN once and has several quotes from Quadrigesimo Anno (QA), thus reaffirming what was stated in RN. John XXIII, in his 1961 encyclical on Christian society Mater et Magistra, however, contains no references to RN, and only a single reference to QA. John Paul II's use of RN is a bit confusing. In his first encyclical on social teaching (Laborem Exercens, 1981), out of the 91 footnotes, not a single one references RN and only two reference QA. Ten years later, in his famous Centesimus Annus (1991) marking the centennial of Rerum Novarum, John Paul quotes from Rerum Novarum 35 times (out of 119 footnotes) and makes almost as many refernces to QA. This is a marked contrast to the attention given to RN since the 1960's (between John XXIII in 1961 and John Paul II in 1981, Rerum Novarum was not quoted by them at all, and Quadrigesimo Anno quoted only three times in twenty-years. Why did JPII suddenly start using RN and QA in his 1991 Centesimus Annos? The obvious answer is that since the CA encyclical was a centennial commemoration of RN, it would be very awkward of him not to quote it. I think, therefore, Centesimus Annos is an aberration rather than the norm. To prove the point, let's turn to the 1994 Catechism of the Catholic Church, which has a lengthy section on the Church's social doctrine in its section on the 7th commandment (2401-2463). Here is an oppotune time to see where the post-Conciliar Magisterium sees the place of Rerum Novarum. How many times is it referenced in the CCC section on social justice? In the CCC section on social justice, Rerum Novarum is not quoted a single time. But wait, perhaps that is not as bad as it seems. We have seen that later encyclicals (like Divini Redemptoris) may not quote RN as much because they draw more from Quadrigesimo Anno, which is itself made up of quotes from RN. So how many times does the social justice section of the CCC quote Quadrigesimo Anno? Again, there is not a sinlge quote in the social justice section from Quadrigesimo Anno. If the two most pivotal documents on Catholic social teaching are not referenced, what then, does the CCC section on social justice base itself upon? Mainly three documents (though there are minimal quotes from a few others). 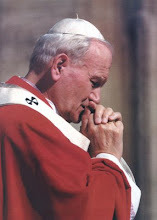 The biggest source, with 15 quotes, in JP2's 1991 Centesimus Annos. Second, with 8 quotes, is Gaudium et Spes (nowehere else quoted as a source for Catholic social teaching), and finally, with 5 quotes, JP2's Laborem Exercens (1981). What does this tell us? First, all of these are post-Conciliar documents. Even more intriguing, all of them are John Paul II documents (it has long been suggested that John Paul, as Bishop of Krakow, wrote large portions of Gaudium et Spes). I think we can understand using CA and LE as sources for the CCC's section on social justice, but (a) why ignore RN and QA? (b) Why on earth use Gaudium et Spes? With only 7 total quotes from RN and QA, we can hardly say that GS is the best preserver of Catholic social teaching. Not only this, but the CCC, in the Index of Citations at the back, does not even list Rerum Novarum among Leo XIII's encyclicals! Go look it up if you don't believe me! Not only in RN not quoted in the social justice section, but it is not quoted at all in the entire CCC! Not one single time. Quadrigesimo Anno is quoted only once. Now, let's ask ourselves one question: How can the Catechism adequately pass on Catholic social teaching when it seems to have the most pivotal documents on the matter categorically left out in favor of Gaudium et Spes and Centesimus Annos? 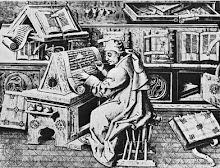 The answer is simple: it is a blatant demonstration of Magisterialism, the idea that everything that is worth saying has been said by this current Magisterium, that post-Conciliar documents or JP2 documents are the only references we need seek, that pre-Conciliar documents are somehow not as pertinent as post-Conciliar ones, and that the current Magisterium has to restate the entire Tradition of the Church in its own terms in order to "bring things up to date." 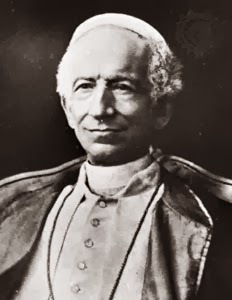 Meanwhile, innocent Catholics reading the CCC are not only deprived of the riches (true riches) of RN, but they are denied the opportunity to know that Rerum Novarum even exists because it is not even listed among Leo XIII's encyclicals (of course, since the CCC only lists sources it quotes from). If anybody thinks Trads are being paranoid about the concept of Magisterialism, here is as concrete proof as we're ever going to get.